In 2016, Burrus grower Matt Bangert and his father Tony were offered the opportunity to participate in the Enlist Field Forward program on their Scott Co., IL operation. 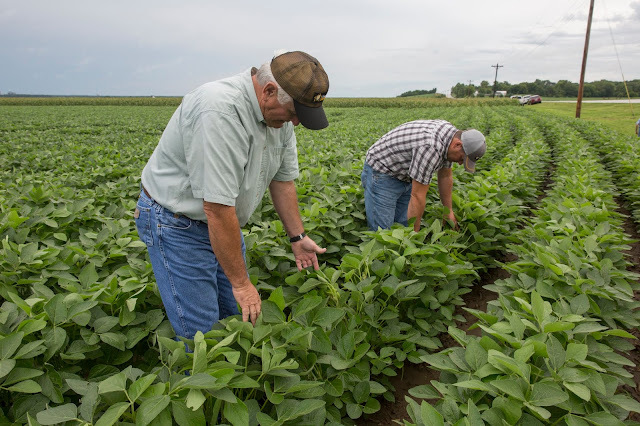 The Field Forward program is a closely monitored field trial of the Enlist® system in soybeans, administered by Dow AgroSciences. With the recent approval of Enlist E3™ soybeans and our Enlist product offerings for 2019, we are sharing the experience and feedback of growers with firsthand knowledge of the Enlist system. Q: Tell me about your experience with Enlist this year. A: We planted June 4 in a conventional tilled seed bed. Came back and sprayed it on June 28; we had knee-high lambsquarters out there, a lot of morning glory, some marestail that was over 12 inches tall, and a lot of waterhemp that was just coming on. We sprayed Enlist, and today there are basically no weeds out there. The lambsquarters that I was afraid would still be there is dead and gone. The waterhemp is gone, it was just total control. Q: What would you tell other growers about your experience with Enlist? A: If you’re having issues with Roundup resistant weeds, it gives a really good alternative to fight those weeds and not damage your plant. From what I’ve seen this year, it’s 100% weed control. Q: How does the Enlist crop safety compare to the others you’ve worked with? A: It’s as good or better. We had zero drift, zero crop damage to the neighboring fields. We have crops right beside this field, and there’s zero damage to those crops. Q: What kind of advantages does “no drift” and “no off-target movement” provide to your operation? A: It just gives us so much more freedom to spray. Some days you can’t spray because of the conditions outside. I feel, with what we’ve seen this year, it’s a lot different. It gives us a lot more freedom to spray when we want to spray and spray next to adjacent fields without worrying that it’s going to drift over. Q: You mentioned that the weeds that you were targeting were lambsquarters, marestail, morning glory, and waterhemp? A: Yes. That was the majority of the weeds out there. Like I said, the lambsquarters were big when we sprayed it, and there’s not a lambsquarters out there today. Matt and Tony Bangert scout their Enlist Field Forward soybeans in Scott County, IL. Q: Are any of those weeds resistant? A: We’ve seen a lot of resistance in waterhemp, and maybe getting 50% control on waterhemp with Roundup, maybe. And with Enlist, we’re getting 100% control on it. Q: Did the control provided by Enlist Duo meet your expectations? A: Yes. It’s a clean field; you couldn’t ask for anything more. Q: How do you think Enlist is going to benefit the Ag industry? A: With the weeds that are becoming resistant, this gives us a new path to cleaner fields and it solves our problem that we’ve been seeing, especially this last year with the explosion of these weeds that are resistant. Q: How do you think Enlist will help in the future in regard to weed resistance? A: Well, if everybody are good stewards and how they use it, and do what they recommend, I feel it’s a chemical that we’re going to use for a long time. Q: When you look at your operation and a product like Enlist, or the Enlist system, what do you feel is the most important about this kind of technology to your operation? A: So specifically to our operation…we grew seed corn, and soybeans, and conventional corn. And when you have seed corn, you’re prone to more weed pressure. So when you plant beans in your rotation, that’s the time you want to clean up your weeds. And they need to be cleaned. And with our Enlist field, it’s basically a 100% clean field; and that’s what we’re after. Q: Why is a clean field so important? A: Weed pressure affects yield. When you’re growing seed, seed beans, you can’t have weeds in there. But I’d say basically yield loss is probably the most important. Q: What advice would you give other growers who are thinking about incorporating Enlist into their operations? A: Spray what they recommend. Don’t cut corners. We’ve got a good chemical here; let’s not throw it away. Let’s be good stewards and use the recommended rates. 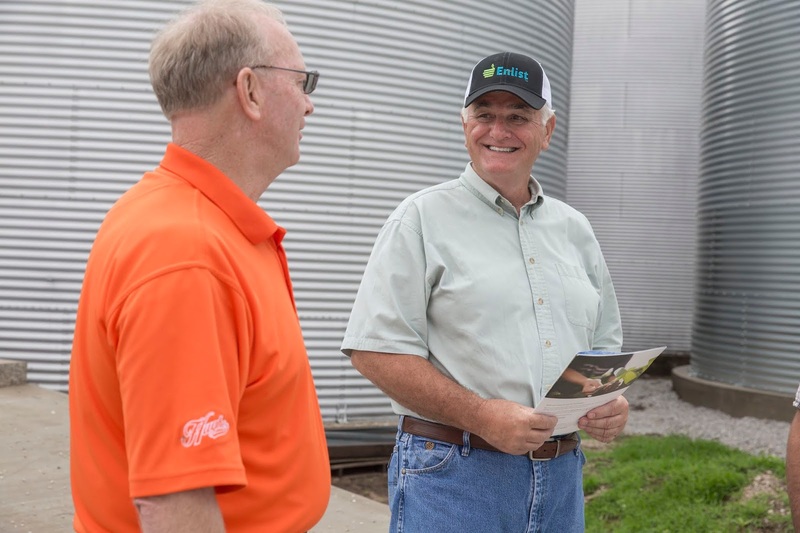 In 2016, Burrus grower Tony Bangert and his son Matt of Scott County, IL was offered the opportunity to participate in the Enlist Field Forward program. The Field Forward program is a closely monitored field trial of the Enlist® system in soybeans, administered by Dow AgroSciences. 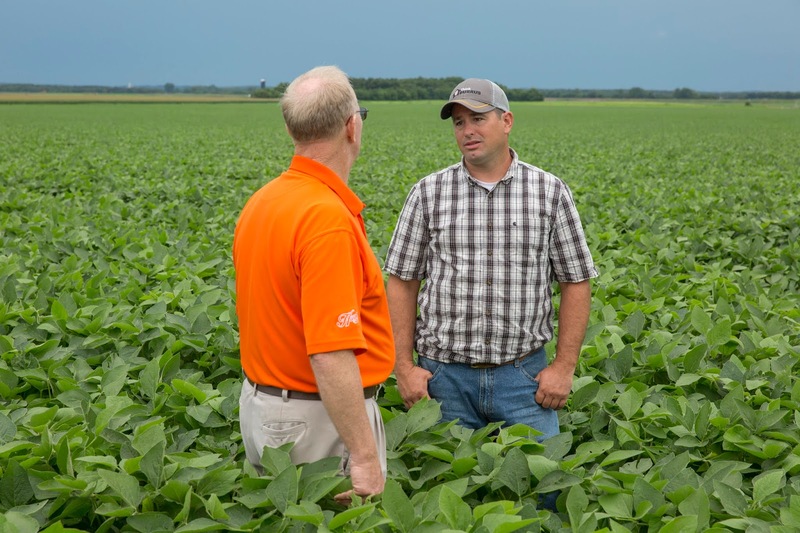 With the recent approval of Enlist E3™ soybeans, and our Enlist product offerings for 2019, we are sharing the experience and feedback of growers with firsthand knowledge of the Enlist system. 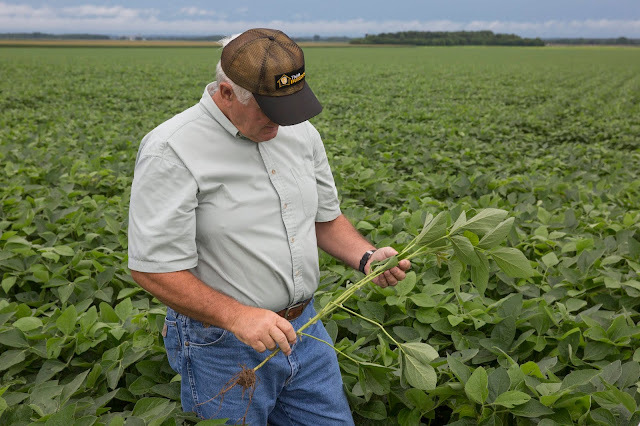 Burrus grower Tony Bangert inspects Enlist E3 soybean plants during his participation in the 2016 Enlist Field Forward program. Q: You’ve been able to watch your Enlist field this year, tell me about your thoughts based on the experience with the weed control and genetics of Enlist? A: The Enlist beans were planted June 4, which is a little late for us and when we were out scouting the field early it was pretty clean. We were going to spray 3 days later and the amount of weed pressure that exploded in 3 days was just awesome. We went from couldn’t hardly find weeds, to seeing 4 inch tall waterhemp; we were literally amazed and this just went out there and cleaned it up. I was just in the field and it’s amazing, it controlled every weed that it touched. I had not seen a weed that it did not control. Q: And why are clean beans so important? A: Anybody that’s ever run a combine can answer that for you. Yield of course, the weeds will hurt your yields but the combining is just so much easier. Q: How about the growth and the appearance of these beans? You said they were planted June 4 and we’re here on the 22 of July that’s 6 weeks. A: These beans were planted in 30” rows and the rows are growing together in 6 weeks that to me is amazing. They look beautiful; I don’t know what else to say, they absolutely look beautiful at this time. When we sprayed the Enlist, I saw no harmful effects to the soybeans at all and I watched it pretty closely. I didn’t see any movement at all, none. Q: And why is that important? A: We have seed corn growing right beside it so obviously we can’t have damage. There was no carryover or movement into the seed corn at all. Commercial corn on the other side no movement in that. There’s just no movement at all. Q: How do you feel about that since there’s 2,4-D in the product? A: I was scared. I grew up with 2,4-D. We, I mean it’s an old chemistry that’s been around forever and we think 2,4-D kills soybeans and obviously in this case it didn’t. It killed the weeds and the beans were fine. I mean—like I said, no damage at all to the beans. Todd Burrus and Tony Bangert discuss the experience with the Enlist system during a field visit. Q: How do you feel that Enlist compares to Roundup in the area of weed control and the ease of use? A: We have used Roundup for a long time. The spraying is not different. I was trying to think of any difference honestly outside of the fact that the weeds are dead in this case. Glyphosate was a wonderful chemical but we have some weeds out there that are not dying from it anymore and we need a new chemistry to make this stuff work and the Enlist bean I was just very impressed with how it took down some good size waterhemp. It took down some marestail that was pretty good size, stuff that the glyphosate just isn’t getting any more. Q: The Enlist system has 3 modes of action, why is that kind of chemistry important for your operation in the future? A: That goes back to not getting resistant weeds out there. We need to attack these weeds through several modes of action because if we don’t, we’re going to wind up with resistant weeds again I’m afraid. Q: What kind of advice would you give other growers who are considering using the Enlist system? A: I would say don’t be afraid of it at all. For people my age, you know 60 years and older that grew up with 2,4-D there’s probably a little bit of a fear factor I would not be afraid of it at all. I mean I’m sure we’ll be using a lot of this in the future.